Here you will find listings with reviews for local vacation rental houses, villas, condominiums and bungalows in Ixtapa having websites or e-mail addresses, and that are located in Ixtapa, Mexico and to its immediate north at Playa Linda and Playa Buena Vista. Six comfortable and economical vacation rental apartments for short and long stays. Five are located in a quiet residential neighborhood of Zihuatanejo and the other in Ixtapa fronting the "Palma Real" Golf Course. All feature A/C, wi-fi internet and cable TV. With room for up to 6 persons. 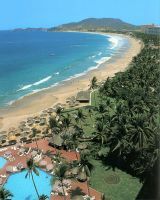 Modern and luxurious vacation rental condominiums in several oceanfront complexes located on El Palmar Beach in Ixtapa. Comfortable and lovely two-bedroom condominium overlooking the pool and El Palmar Beach, available by week or month. Sleeps up to six and features a full kitchen, terrace with Jacuzzi, air conditioning, and TV. Beautiful and luxurious vacation rental properties located in an exclusive residential area near Marina Ixtapa. Featuring panoramic ocean views, 24-hour security and access to pools, beach club, tennis and golf. 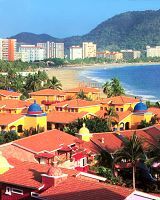 Time-share resort accommodations in Ixtapa-Zihuatanejo with rentals available overlooking Playa El Palmar and the Palma Real Golf Course. 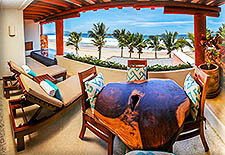 Exclusive luxurious vacation rental properties in Ixtapa and Zihuatanejo including some that are quite affordable. Modern and well-maintained condos, apartments, villas and homes perfect for couples and families. Some accept pets. Locations include beachfront as well as fronting a golf course and quiet residential areas within easy walking distance to the beach. Affordable studio apartment condominium rental with two matrimonial beds, located in front of the beach on Playa El Palmar, next to the Palma Real Golf Course. A two-bedroom privately owned vacation rental on Playa El Palmar with views of the beach and ocean. Comfortably furnished and includes balconies and many amenities. Full access to hotel services. A two-bedroom private condominium overlooking Playa El Palmar on the sixth floor with an ocean view and two terraces. Resort hotel facilities, towels, bedding and maid service are included in rental. One- and two-bedroom furnished condominiums offered as vacation rentals with many resort hotel services, including use of the pool, restaurants and beach services. One on the 2nd floor, the other on the 6th. Spectacular views. Located on El Palmar Beach in Ixtapa.